Smartphones that have the ability to pinpoint locations, whether through the embedded GPS chip or through the use of the network towers, are nothing new. This technology can, however, go well beyond getting directions to the nearest gas station. One company, Ginger.io, is making some interesting propositions about how it could be used in healthcare. The company is a spinoff of the MIT Media Lab, from professor Sandy Pentland’s research group. It has developed software that helps healthcare providers and pharmaceutical companies monitor and track patient behavior via their mobile phones. The goal is to take the enormous amount of data that could be readily collected by mobile devices and find ways to use it to track health. And if investment is a sign of potential, the Ginger.io could really go places – it has already acquired $1.7 million in its first round of financing. The algorithms that are used to find patterns within the noise are based on research done at the MIT Media Lab. While there is not specific information on specific phones or platforms available, it appears that built in features like location tracking, accelerometers, and so on would all be potential sources of data. For healthcare providers, the potential applications of this data may seem nebulous. But believe us, they are there. For example, take the population of an inner city – knowing how often they are anywhere close to a grocery store which serves affordable healthy foods could be very informative. Or using the accelerometer to understand the activity level of an elderly population or a group burdened by diseases like coronary artery disease, diabetes, or hyperlipidemia. Or even as a sort of early warning system for elderly or homebound patients. Integrating this kind of system into a health management system, where feedback mechanisms are used to help drive healthy behaviors, would be another interesting application of the technology. We have previously discussed the potential of apps that monitor and track blood glucose, heart rate, and other physiologic information. A short video from the website shows how the company is currently using their technology to address this. They were recently made finalists in the Sanolfi aventis Data Design and Diabetes (DDD) Contest. As such, the company will be launching a month long pilot of the Ginger.io application with diabetes patients in the future. As the company clearly recognizes, clinical data is the currency of healthcare. As such, they have sought partnerships with healthcare institutions and are working with several big pharma companies to study various implementations of their technology. 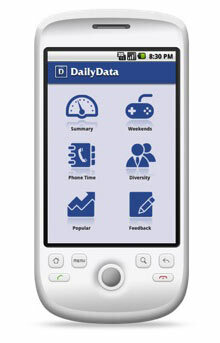 In fact, Cincinnati Children’s Hospital has utilized their mobile software technology in a study of patients with inflammatory bowel disease (though we are not exactly sure what this application is). As we have found with other large data repositories – insurance company databases, population surveys, and so on – we often find surprising, unexpected, and informative insights. Ginger.io represents a move into the mobile space, where a whole new dataset offers a new, different way to look at patients, populations, and disease.